I was asked to design an adult bib and make a couple of coats for disabled wheelchair bound clients in a sheltered home. The brief was they needed to be fashionable and functional. Where do I start, Well fashion is what some of us use to assert our personality and identity, additionally we use fashion to enhance or hide our imperfection, and I would argue that is the same if not more so for disabled people. As these clients spent the day in a wheelchair which encases their back for support, it was important that the coats were comfortable with design features that enabled the care attendants to get the coat on and off with ease. Some of the design featured I styled the coat with were a trapeze or wide Aline shape which helps conceal excess bulk around the stomach, and would allow for a blanket to be placed underneath wrapped around the legs for extra warmth. I added raglan sleeves as they are easy to get in and out of and adding shoulder pads can enhance the silhouette of the coat. The coat was designed with a longer front which falls over the knees and a shorter back, so in the sitting position the back falls to the seat, and the client does not have excess bulky fabric bunching behind their back waist . The false front design give the impression to the outside world of a normal coat front fastening design, but the opening is at the back and fastened with Velcro, which allows for ease in placing, without too much discomfort to the client. I think I have met the brief for both the clients and the care attendants. I will be posting the bib and send coat here soon. That coat is amazing! I worked in a nursing home and jackets were the worst. 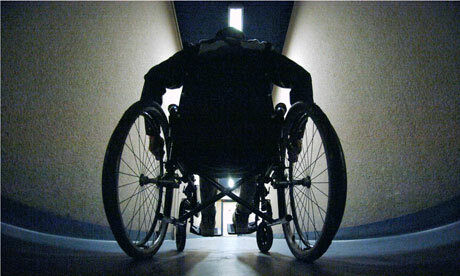 A llong time ago, I saw an article about a company that desidned clothes specifically for the wheelchair-bound. I was intrigued... I don't know if the company is still around, though. Your customers will be so pleased to see this coat!! I have been looking for a coat for my daughter and it's very hard to get one as her arms are so limited in movement. When are you going into production? Or can you make one-offs?